Display your celebration’s details in the most festive way! 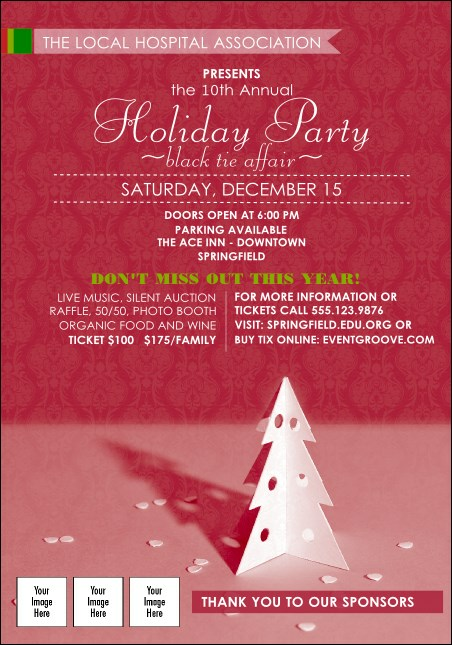 Use the Paper Christmas Tree Red Club Flyer to attract attention to your event and stir up holiday cheer. Patterned crimson and a whimsical Christmas tree set the scene for function details, which are presented in contemporary white and green typeface. Add three logos of sponsors at the bottom. Shop hundreds of professionally designed flyer templates on TicketPrinting.com!